During the daylight hours of November 23rd, 1963, the army Chief of Staff ordered gun salutes, one round each half hour, fired at all U.S. Army installations equipped to do so. My uncle, Calbert A. Cree (1939-2012), was the squad leader that fired the gun at Arlington Hall Station, Arlington, Virginia. 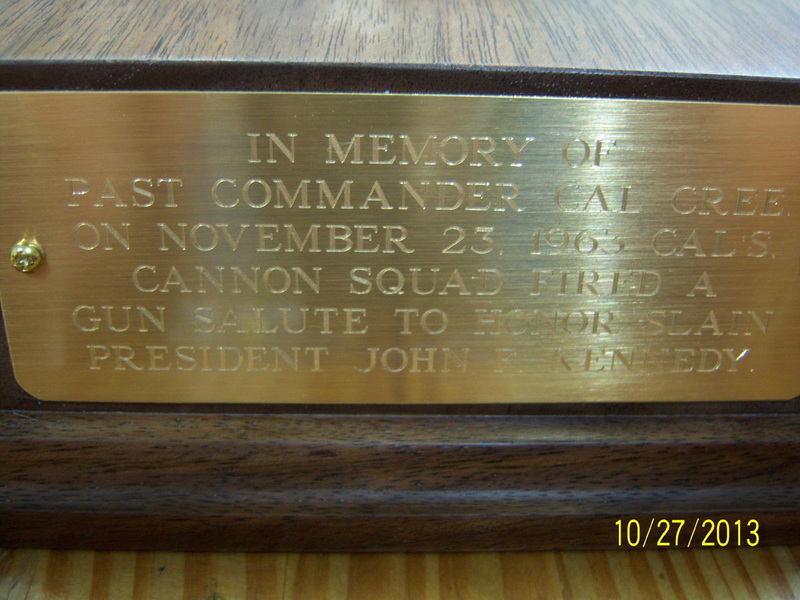 The national gun salute was in honor of President John F. Kennedy. 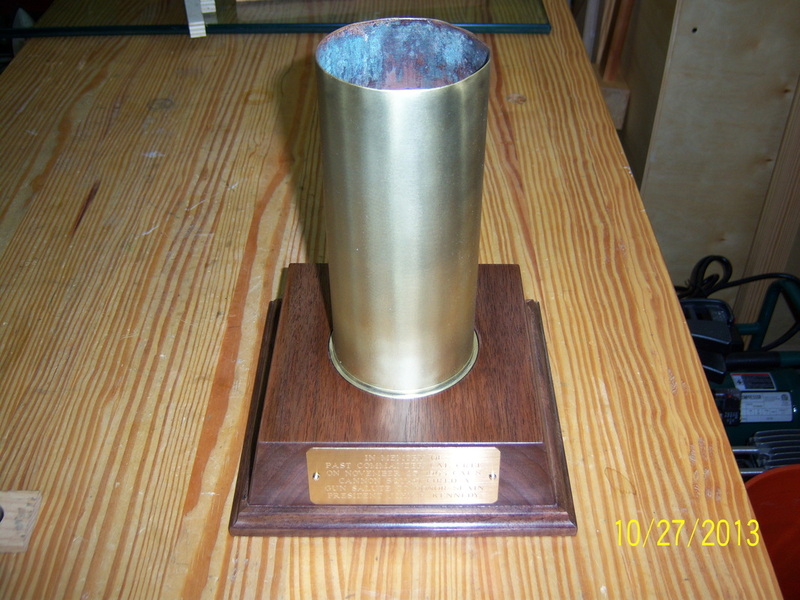 My father asked me to construct some kind of base to display the shell, which would be presented to a local V.F.W. on the 50th anniversary of President John F. Kennedy's death. This holds two honors: one being the memory of a great past president; the other being honoring great American, Uncle Cal, who served his country fighting for veteran affairs until the time of his passing. 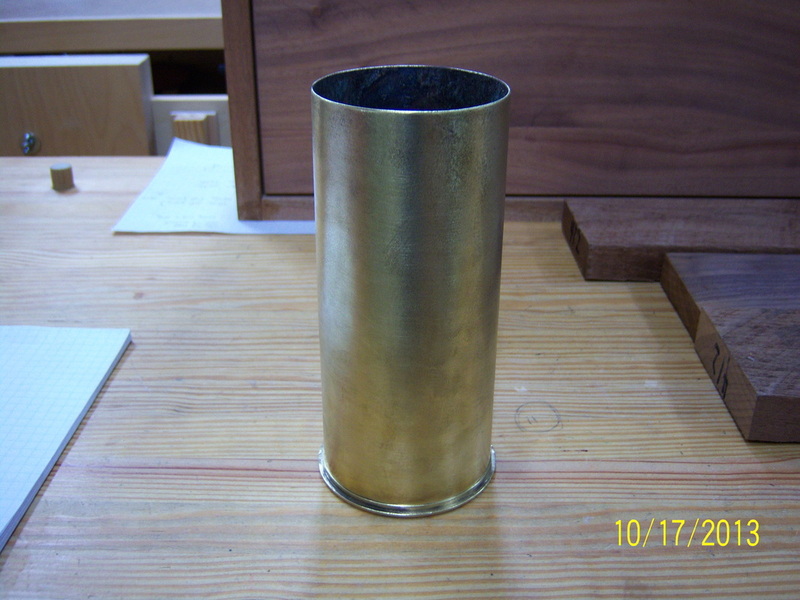 My father and I thought that a piece of walnut would look good with the brass shell. 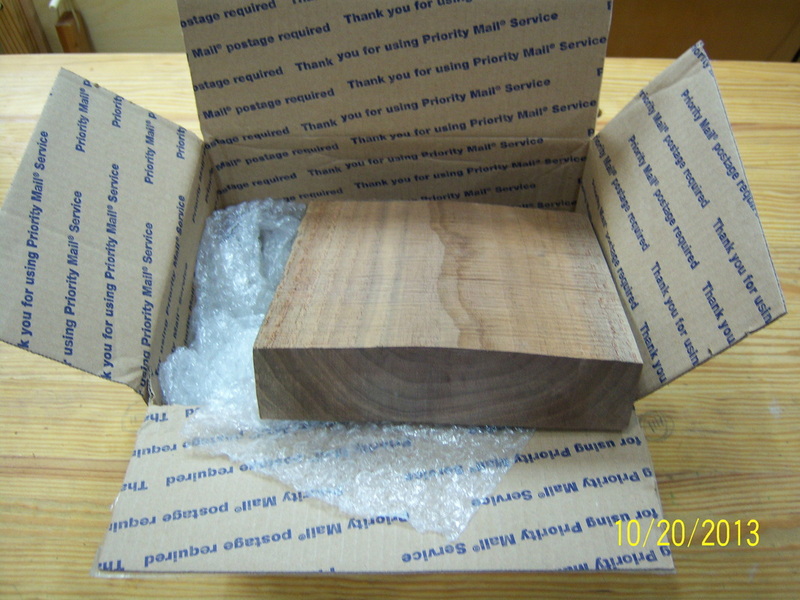 Answering a call for help on www.woodnet.net, John " jteneyck " was kind enough to send me two pieces of walnut that finished out to be just over 1 5/8" thick. 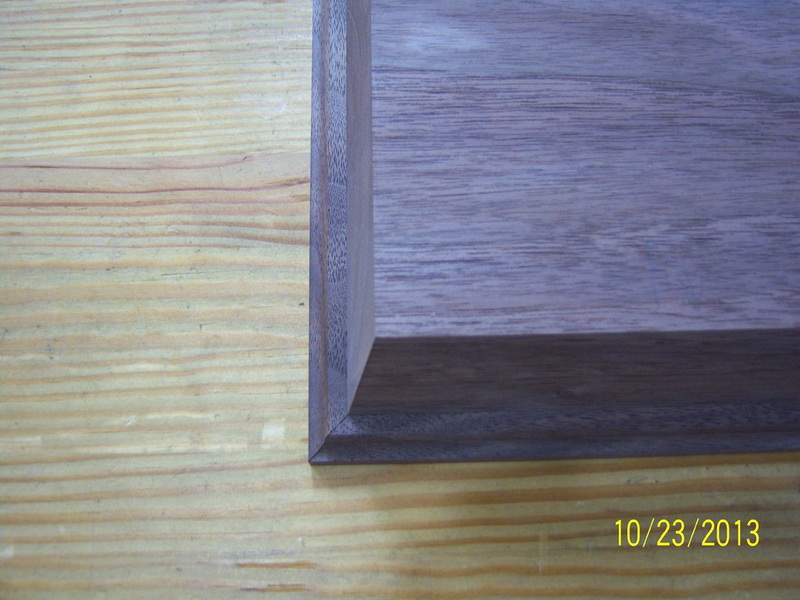 The walnut slab was nearly flat on one side which made dimensioning the piece a lot more simple. 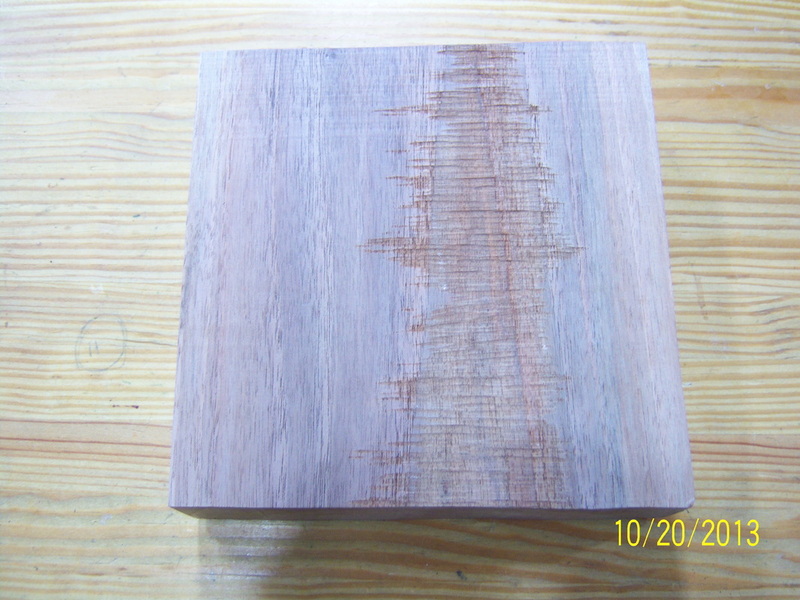 Most of the work that needed to be done on the bottom of the walnut slab was to lower one high corner and to remove some saw marks. 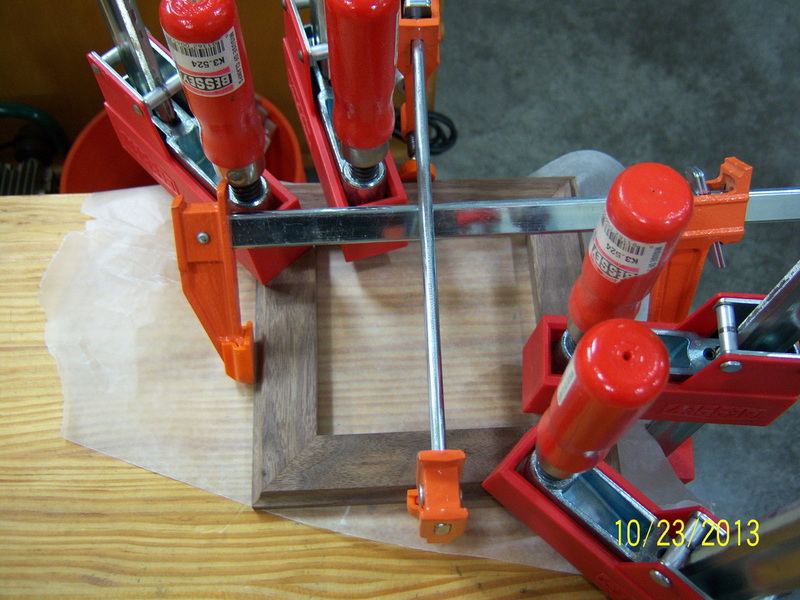 Because the "top" of the walnut slab had a pronounced radius, a clamp was used to stabilize the piece so that the bottom surface could be planed. 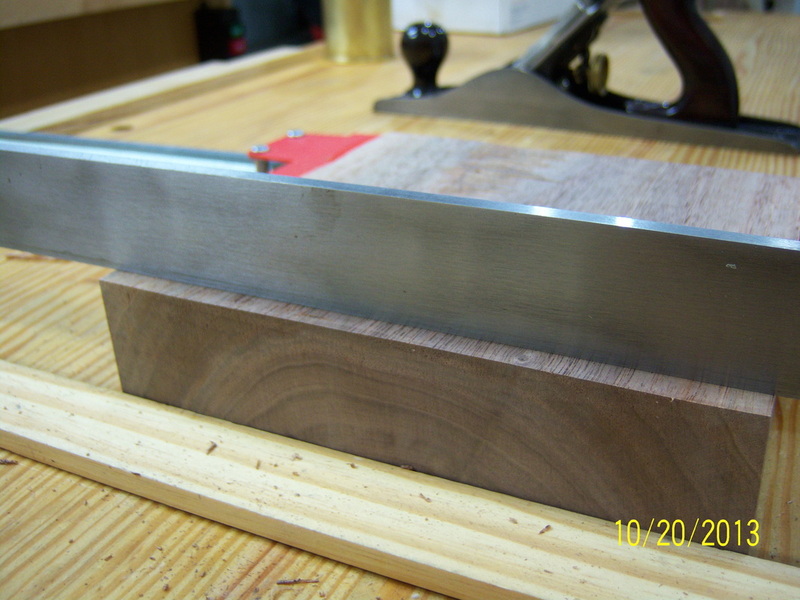 Using a straight edge, you can see how the piece was close to being flat from the beginning, but needed some work to remove the dip left from the saw marks and to level out the corners. 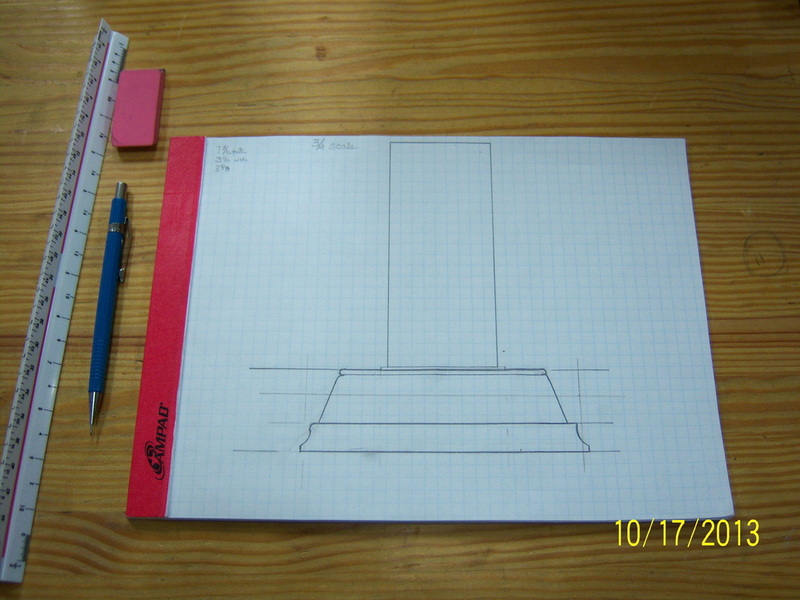 To flatten the walnut slab, I began by planning across the grain. 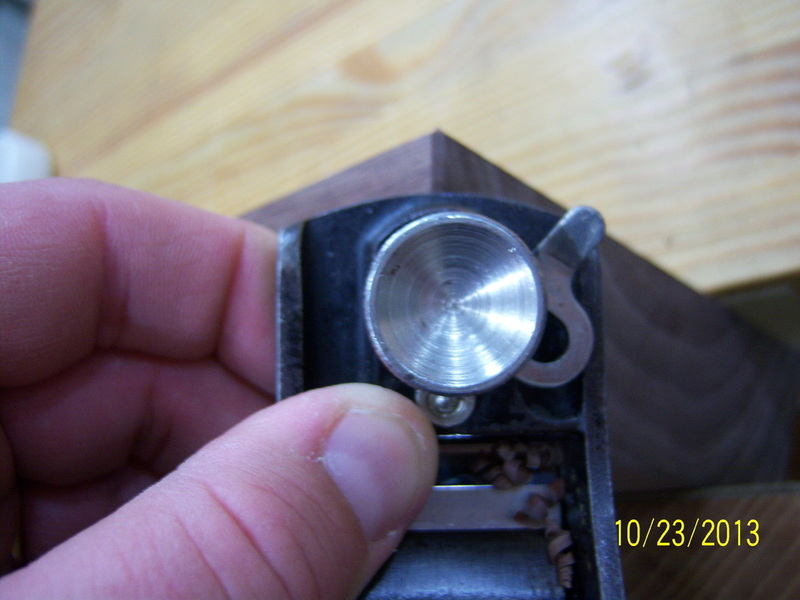 I then planed diagonally across the grain and then finished by planning with the grain. 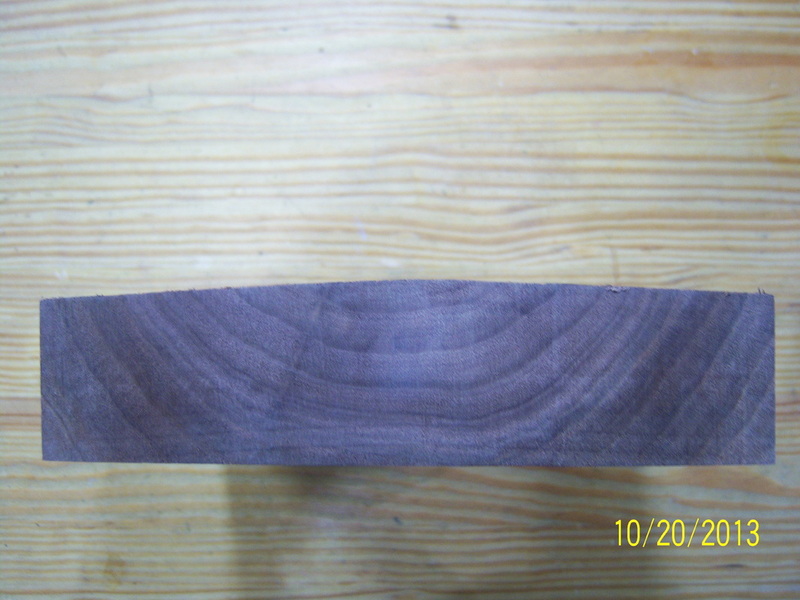 The majority of the bottom of the piece was flat, though I left a few of the saw marks to be cleaned up by the powered thickness planer. 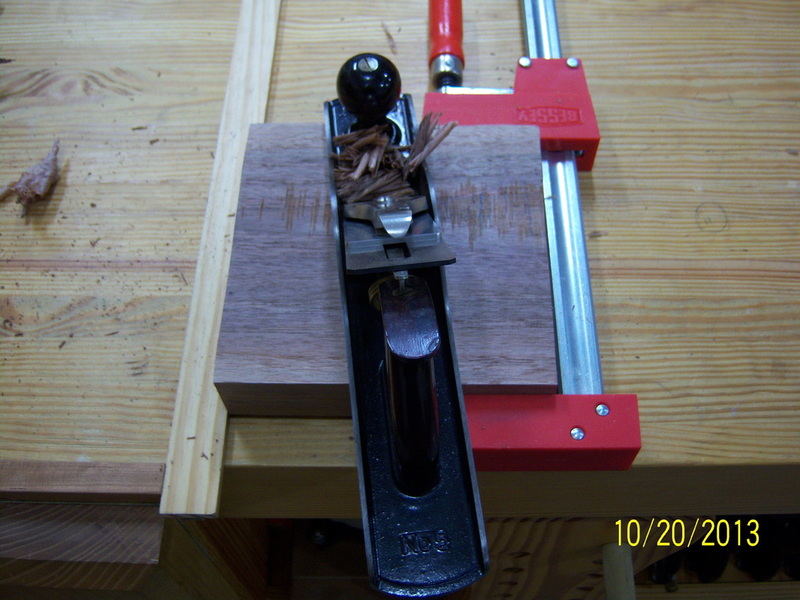 I fed the piece of walnut diagonally though the thickness planner which eliminated the bit of snipe I got on the first pass that was fed through square. 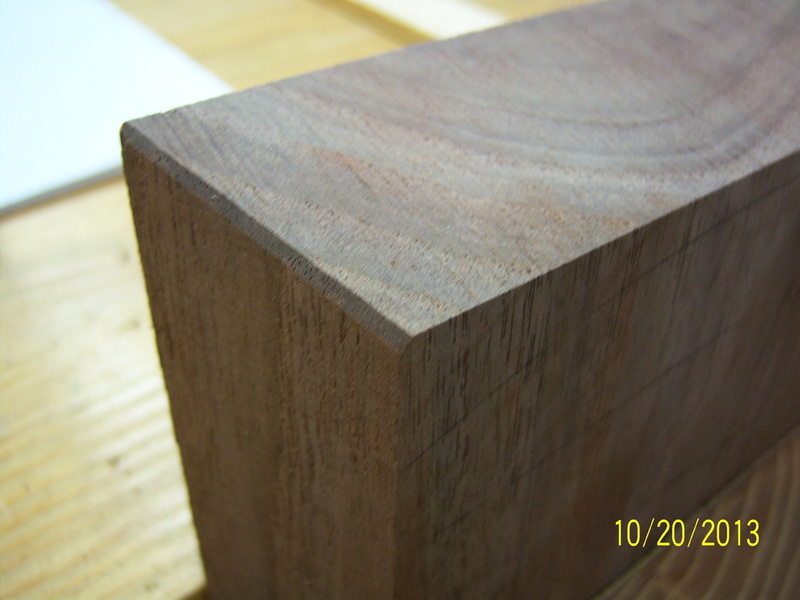 After thickness planning, I took a few passes with a smoothing plane to remove a few tool marks. 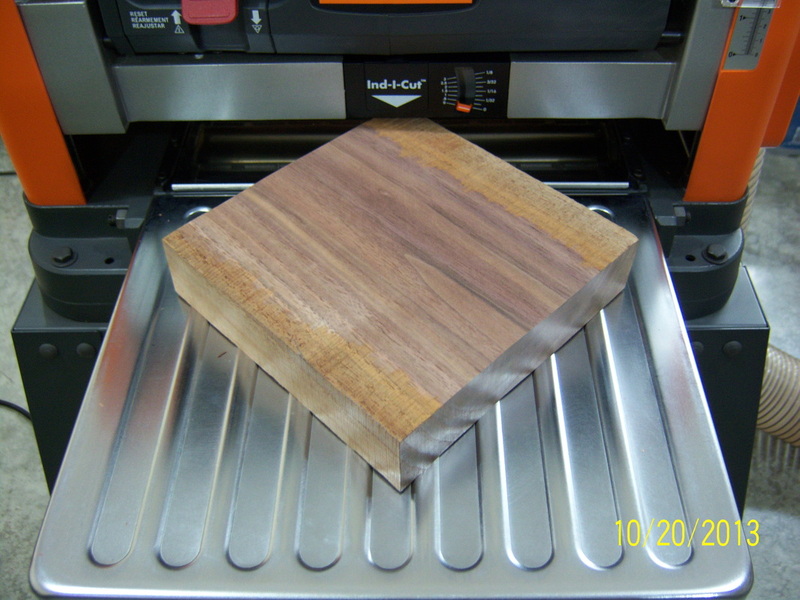 The walnut slab was cut square on the table saw. 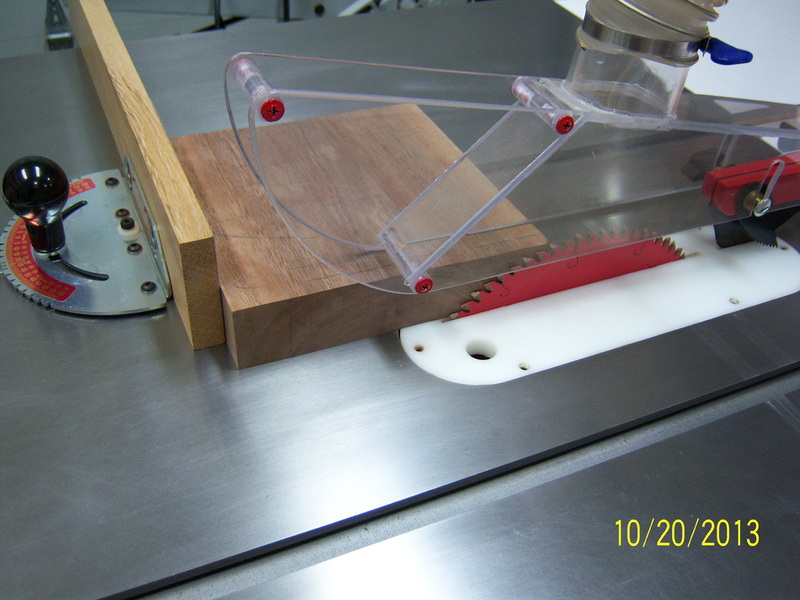 Setting the band saw at about 10-degrees, a bevel was cut on all four sides of the piece. 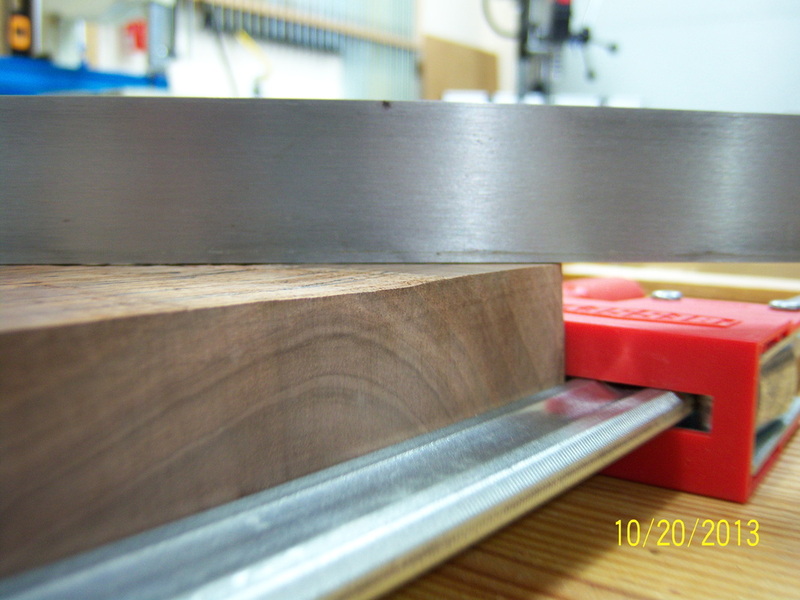 Before using a plane to clean up the band saw blade marks, the far side of the end grain was beveled to reduce any grain blowout caused by the plane blade. 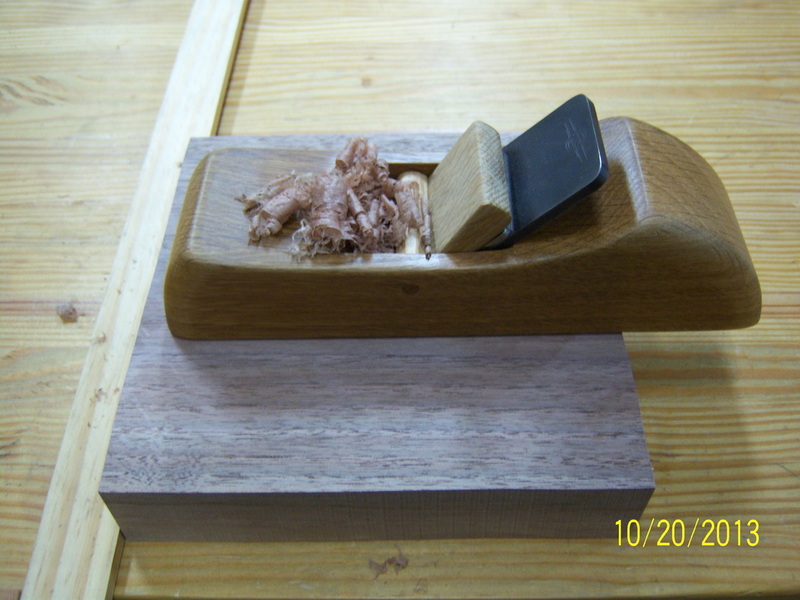 Using a #5 Stanley plane, all four sides of the piece of walnut were planed smooth and all of the band saw blade marks were removed. 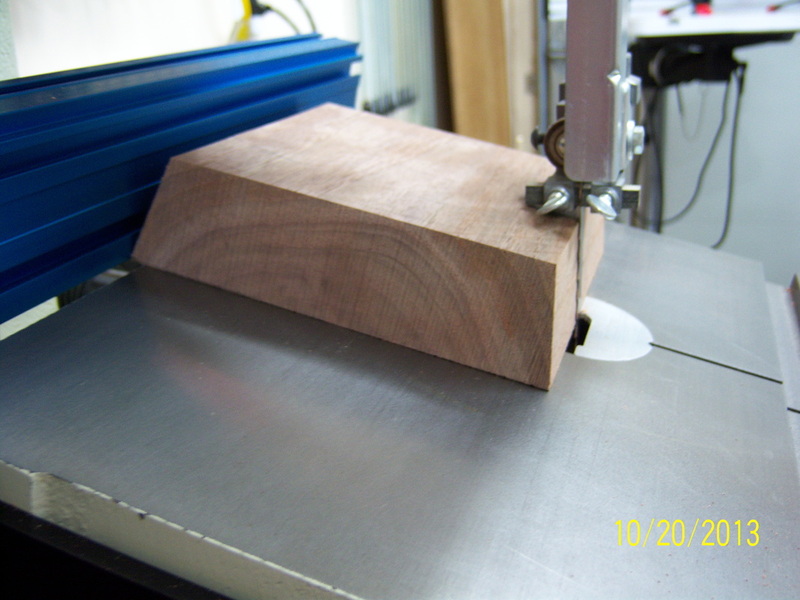 I had a piece of walnut that was already planed to a thickness of about 1/2" that was the perfect thickness for the profiled foot of the base. 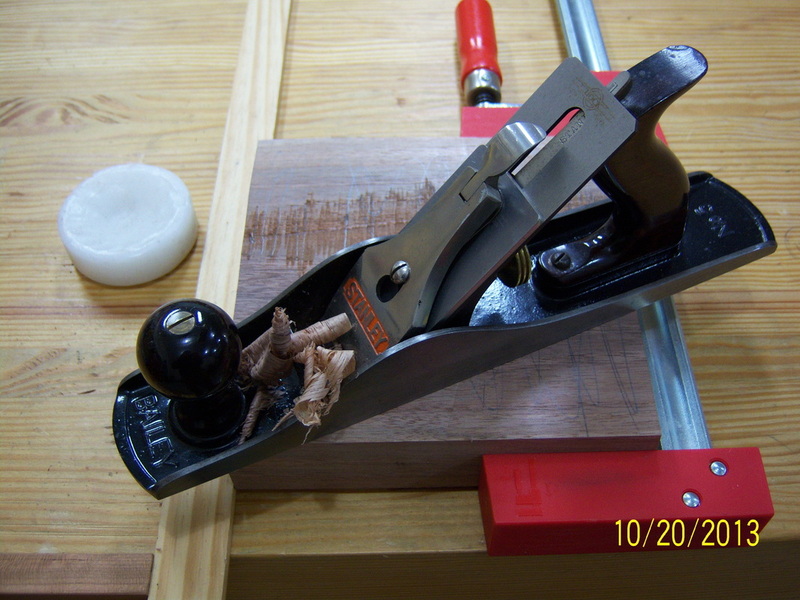 Using a #7 Stanley plane, I made sure both edges of the board were flat and square. 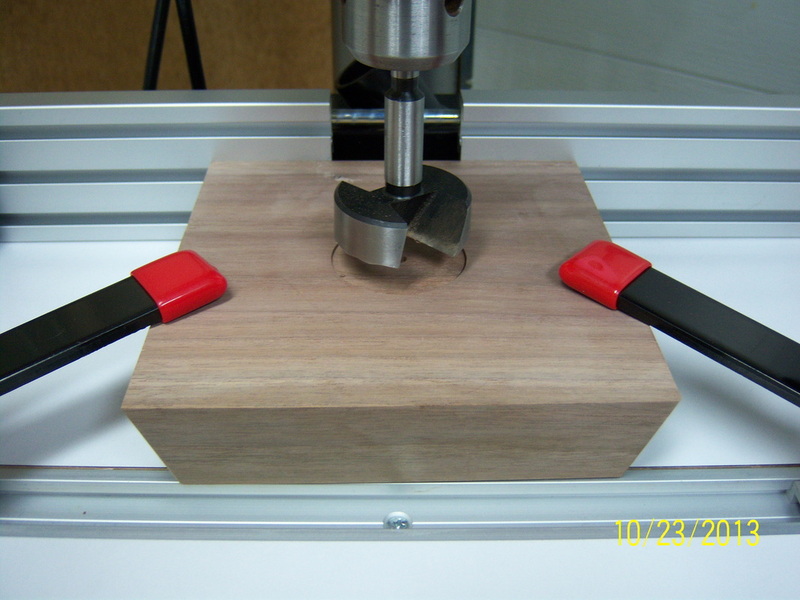 After some experimenting with different pieces of scrap and various bit height changes, a simple round-over/cove profile was cut into both sides of the board. 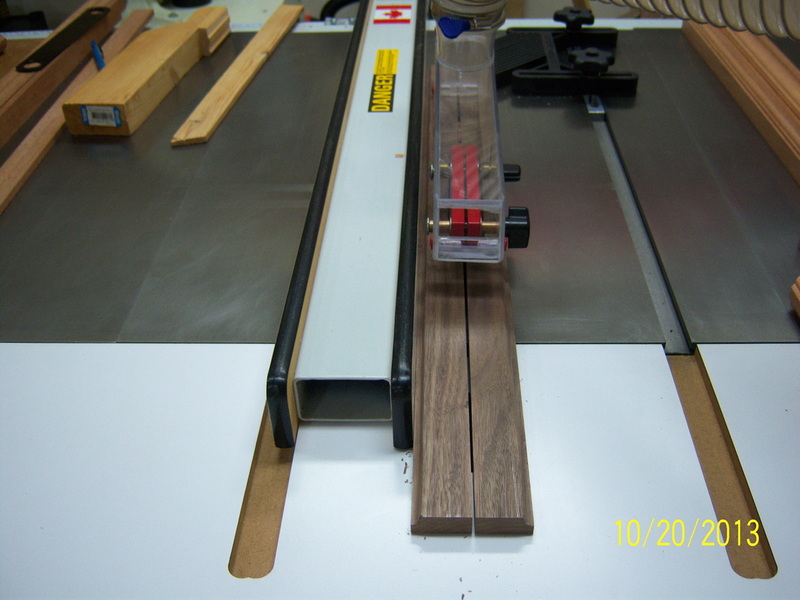 After routing, the board was cut in half producing more than the needed 2-feet worth of profiled material. 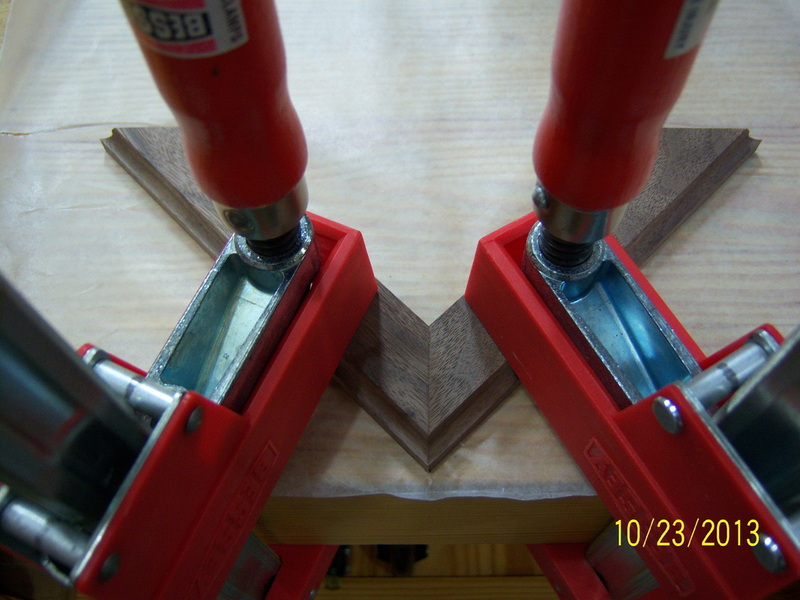 After the corners were mitered on the tables saw, I glued and clamped two pieces together at a time forming half of the profiled foot. 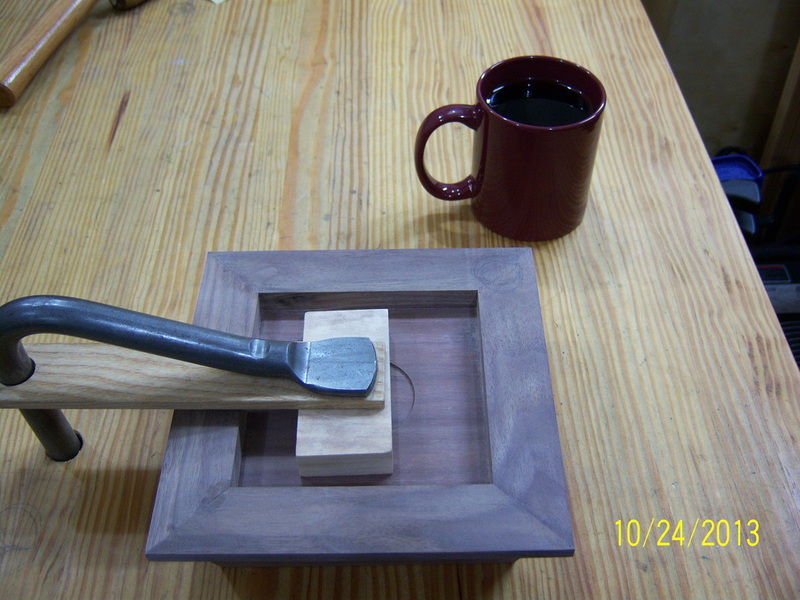 After the two sets of two pieces were dry, I clamped them together forming all four sides of the profiled foot. 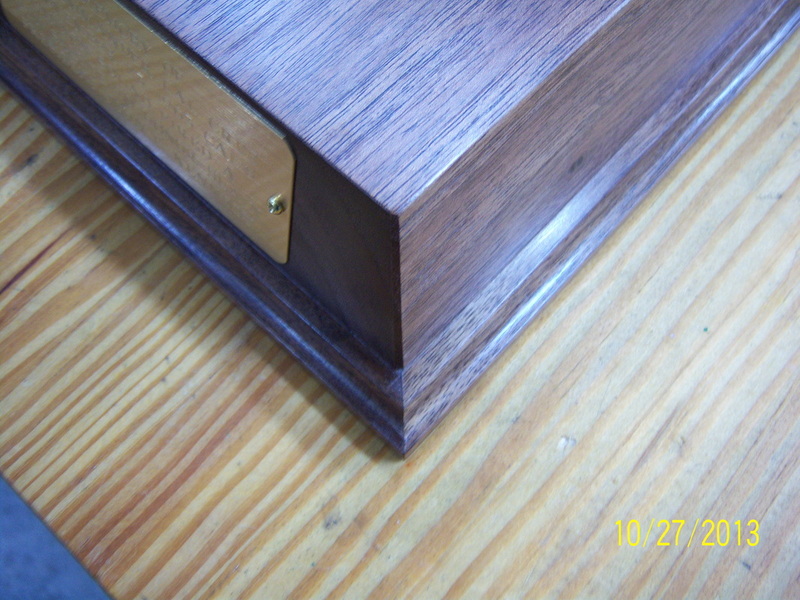 As you can see, I cut the profiled foot about 3/8" longer than the solid wood base. 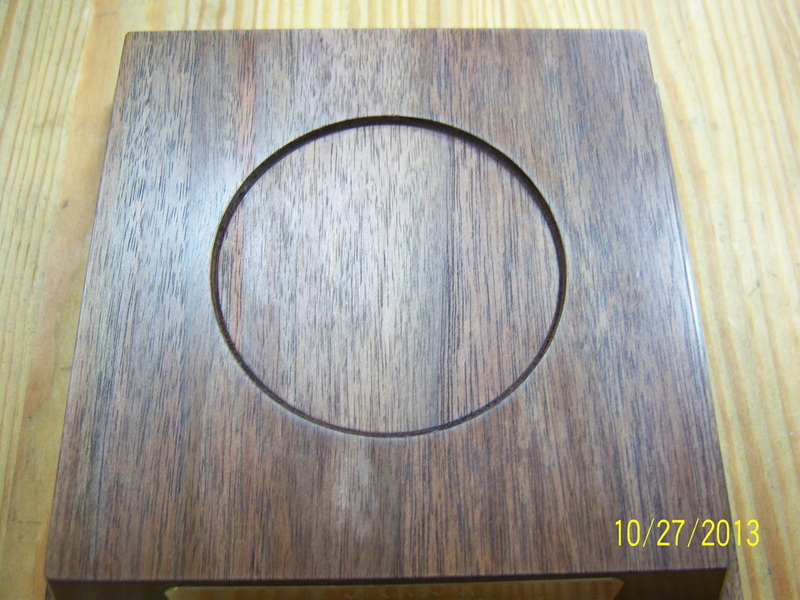 That created a 3/8" reveal around all four sides of the solid walnut base. 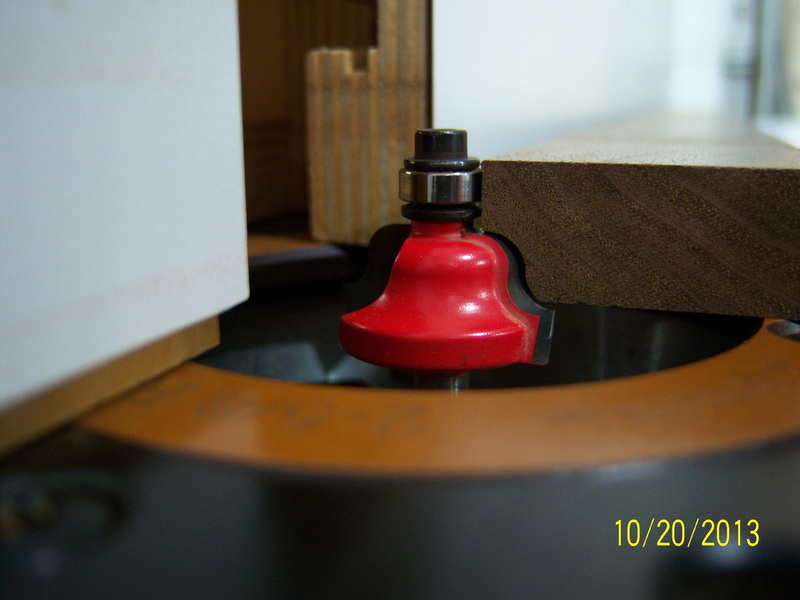 Prior to gluing the solid base to the profiled foot, I used the drill press and a 2" forstner bit to cut a slight recess into the bottom of the base to later insert a project medallion. 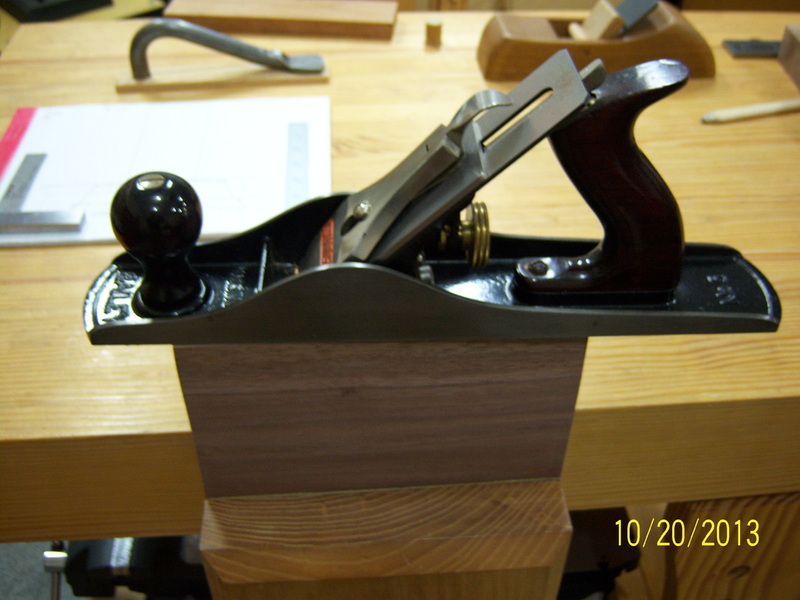 Using a block plane, all four corners of the solid walnut base were beveled for aesthetics. 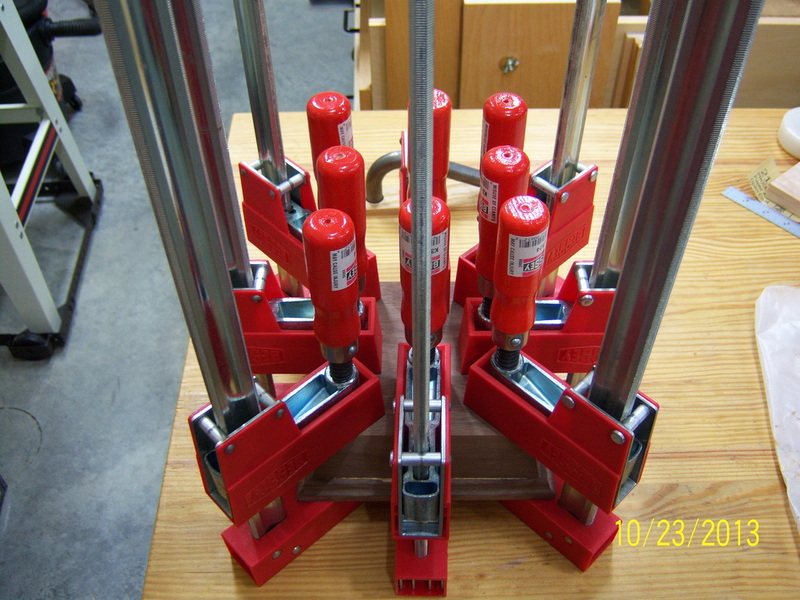 Though it appears like clamp overkill, the profiled foot is being held in place at the corners with an additional clamp providing pressure to the center of each side. 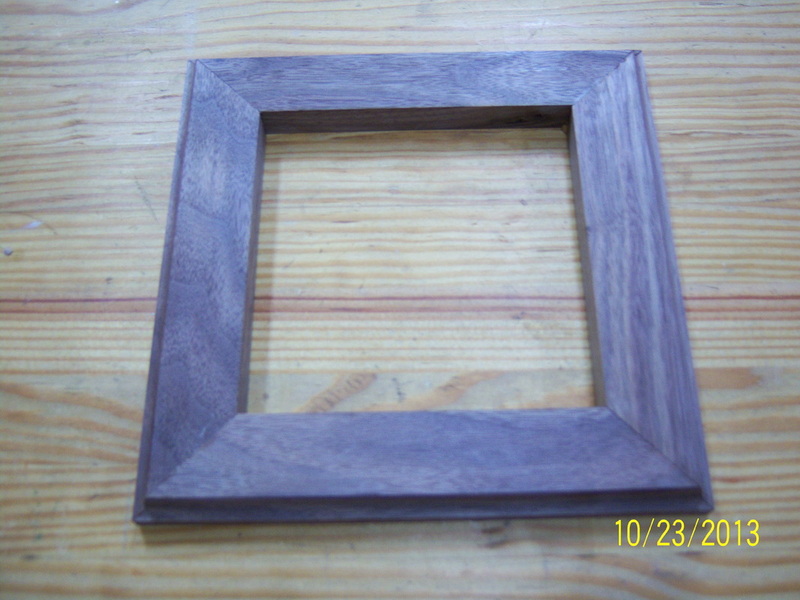 After the glue dried, there was just a slight unevenness with two corners of the base. 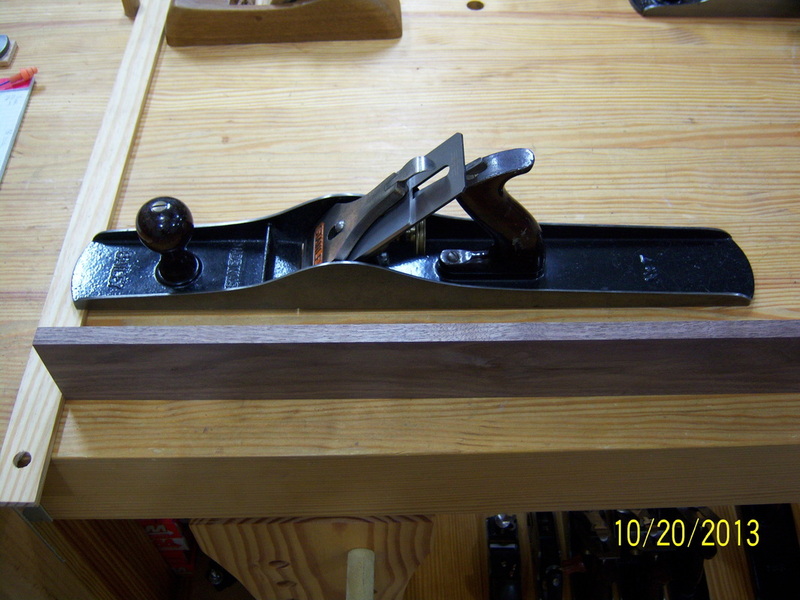 Those corners were marked and reduced with a plane. After a few passes with the plane, the base sat firmly in place. 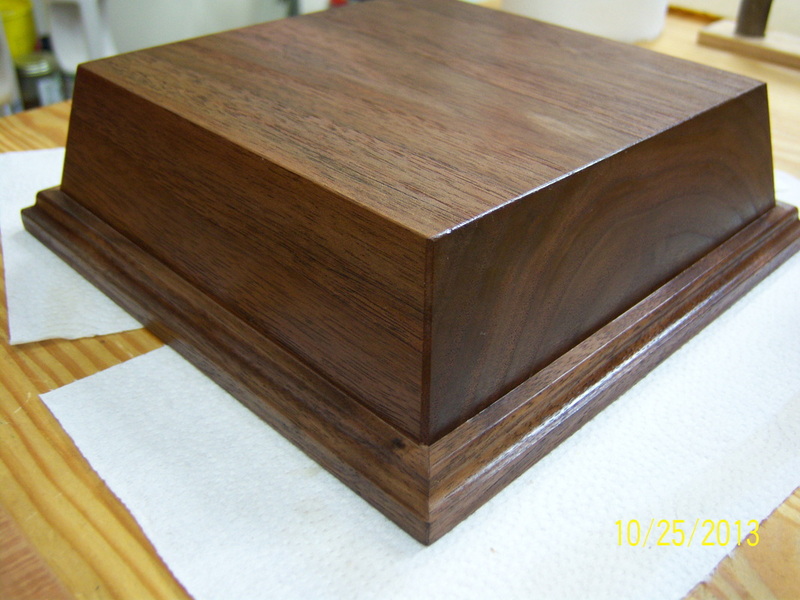 Here is the first coat of Waterlox, which has brought out the dark color of the walnut. 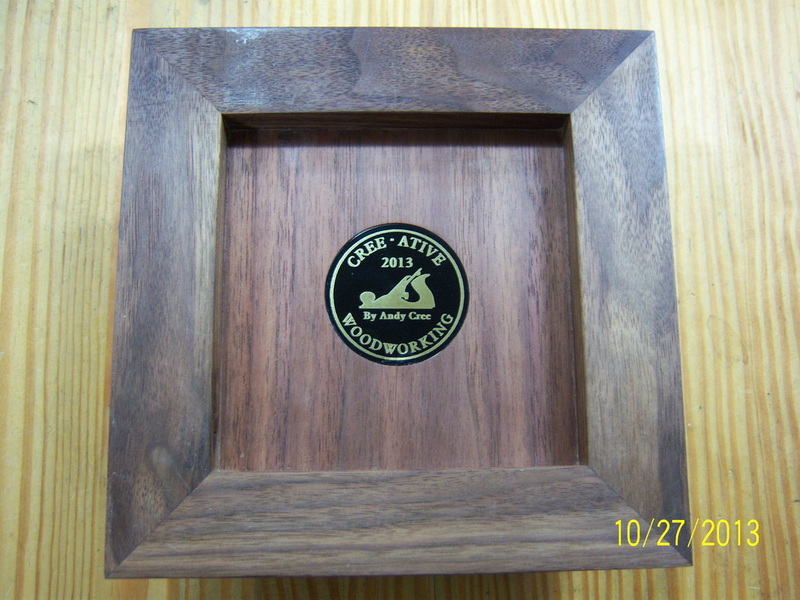 The color will only improve with additional coats of finish. 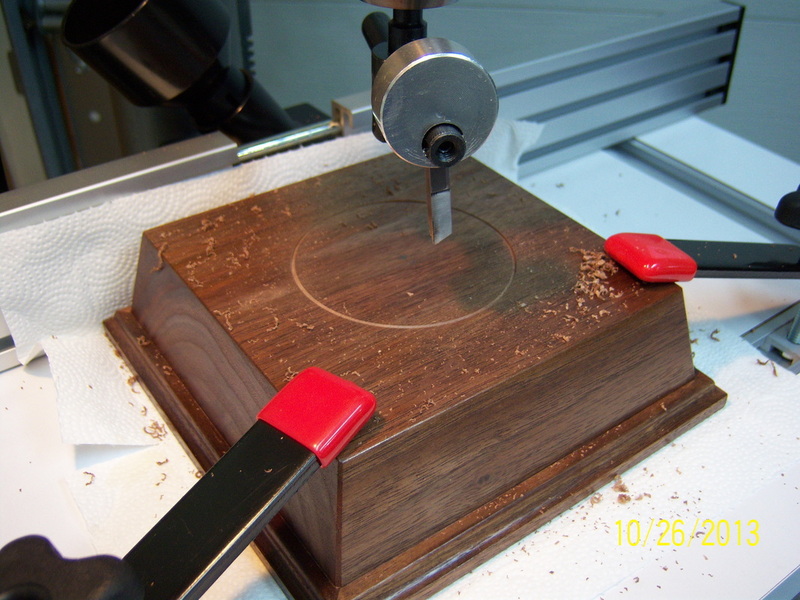 Using an adjustable circle cutter, I cut a 3 7/16" circle into the top of the walnut stand to hold the brass shell. 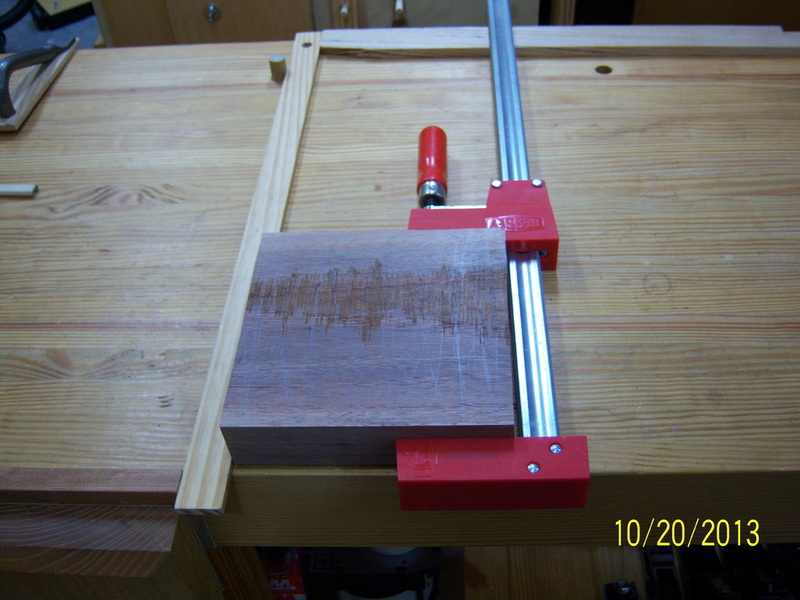 Usually this type of process would have been completed prior to applying any kind of finish, but the cutter arrived a bit late and I had a deadline to try to meet. 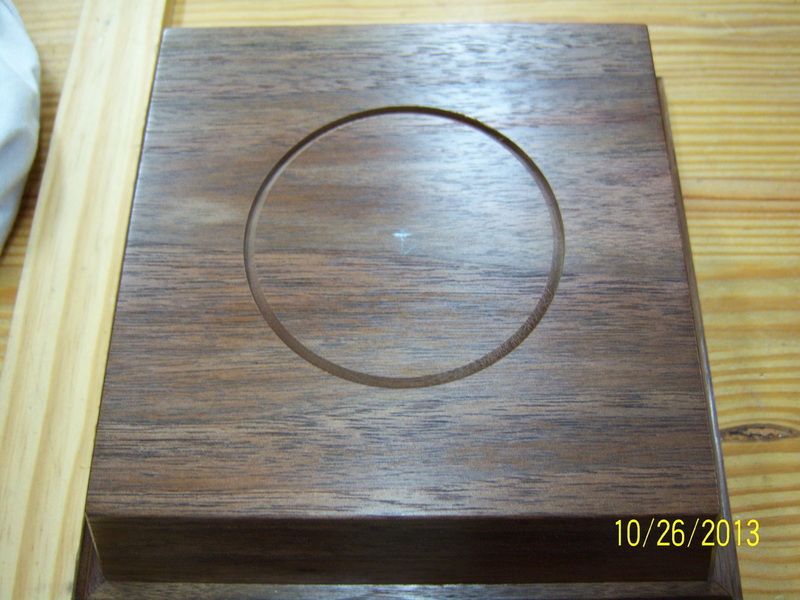 Once the circle was cut, I used a router plane to recess the hole to about 1/8" in depth. 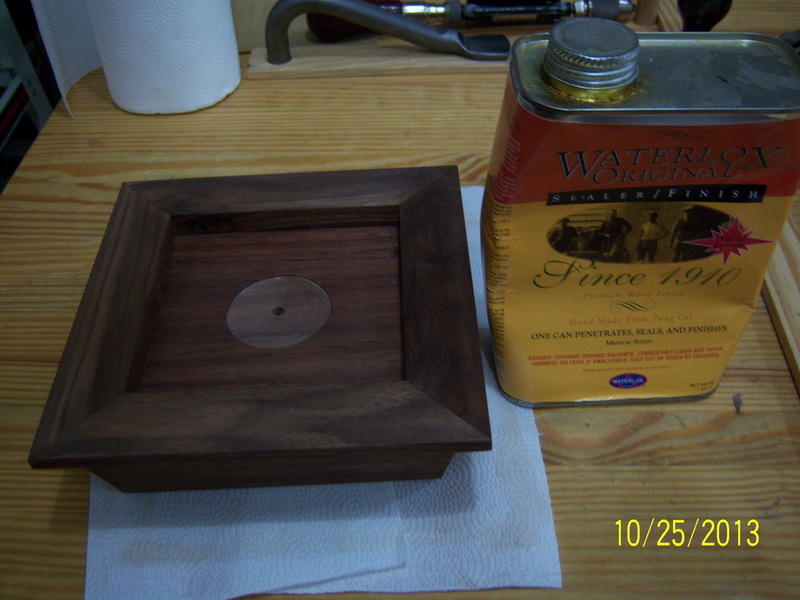 One of the last things done was to epoxy the medallion in place. 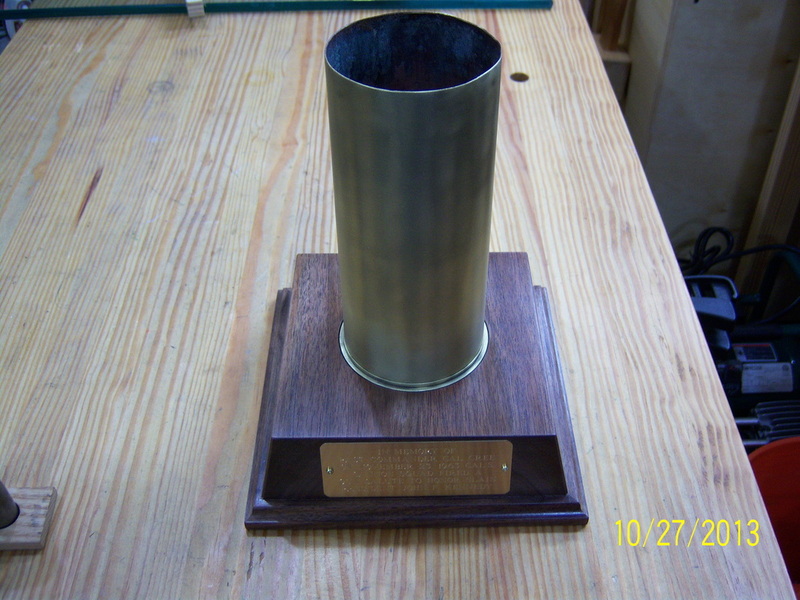 Here is the finished product: A display stand for the 75-mm brass shell.